Unlike multipurpose assistants such as Alexa or Siri, Valyant’s fast food AI has just one ability: greet drive-thru customers, take their order, and send them down the line. According to Carpenter, putting an AI in charge of this task could benefit both customers and restaurants. Good Times COO Scott Lefever believes even the employees benefit from the fast food AI platform. “By freeing employees to spend more time focused on the customer at the window, we’re providing better and faster service to our customers and a more enjoyable experience for our employees,” he said in the press release. Right now, Valyant’s AI is only taking breakfast orders and only at one restaurant, but there’s a clear trend of the fast food industry moving toward automation in general. We’re seeing an increase in self-serve kiosks, robots that cook, and self-cleaning equipment. 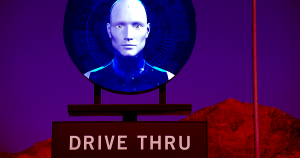 These machines aren’t necessarily taking jobs from humans either — according to several reports, fast food companies are having an increasingly difficult time finding and keeping employees.